LeMaker Guitar is a high performance SoM with low cost which is designed by LeMaker Team. It adopts Actions S500 SoC (Quad-core ARM® Cortex™-A9R4 CPU and PoweVR SGX544 GPU), 1GB/2GB DDR3 and 8GB Flash. We can make kinds of SBCs with different interface when we combine one LeMaker Guitar and one specified or personalized LeMaker Guitar base board together. 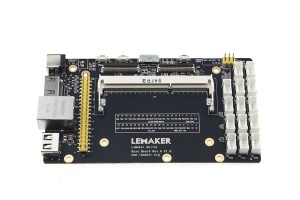 In order to make the users more convenient to DIY their own platform with LeMaker Guitar, LeMaker Team already designed kinds of LeMaker Guitar base board, which significantly reduce the redesign period of your own customized LeMaker Guitar base board. Run as a Micro Server. The tutorials that already available in the WiKi will keep update. Welcom to share more tutorials or tools to all users on Github.